My latest book has many pictures and projects some of the super things I've seen on my travels around the Steampunk globe and how to craft them yourself! We're all terribly excited. It features many of my favourite pieces and some of my excellent Steampunk friends. We (at Dickens and Rivet) would love to know what you think! "This title covers Victorian charm and steam-powered machinery parts with modern day elements and technology. 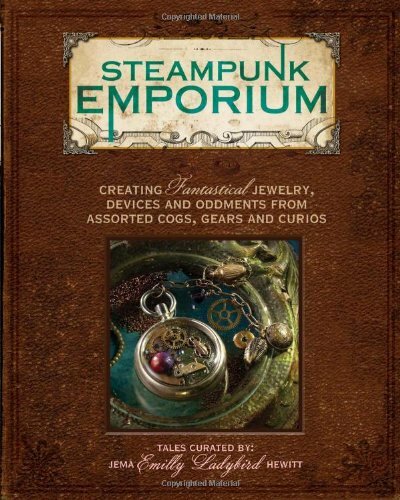 Whether a converted steampunk enthusiast or a newcomer to the genre, this funky and fabulous book is the perfect practical introduction to the whimsical world of steampunk jewelry. Each of the five themed chapters has its own imaginative story, and the 20 different projects allow you to make characteristic pieces from decadent jewellery to wine charms. This highly visual book is packed with photography and design elements to give a real flavour of the steampunk process and readers are taught the beginning-level jewellery and related techniques."